Investment and the focus on energy efficiency will be critical to achieving the global emissions reduction targets set out in the Paris Agreement, and must be embedded in Britain’s new Industrial Strategy to drive economic productivity. During the UN’s COP22 climate talks in Marrakesh last week, the Carbon Trust claimed that energy efficiency is “the most cost effective way of tackling climate change” and reaching international carbon reduction targets. The Carbon Trust report goes on to suggest three action points to help deploy energy efficiency on a global scale. These include stronger government policy to attract investment; increasing awareness and providing technical assistance; and building local skills and trust to build momentum and create a self-sustaining market. The Association for Decentralised Energy’s audit shows that Britain’s industrial, services and domestic sectors saved more than £1.7bn and reduced enough energy to heat 13 million homes between 2010 and 2015, thanks to energy efficiency measures. The UK lags behind many of its European counterparts on energy efficiency policy with Germany, the Netherlands and France all adopting significantly better policies than the UK since 2011, ADE says. So how can Firefly contribute to this drive for energy efficiency? The Cygnus range has become the industry standard for providing hybrid power on construction sites across the UK and into Europe. The challenge is that on-site power use always increases during winter for heating and drying. Site Managers also need to minimise noise, particularly at night, in built up areas for longer periods through the dark winter nights. 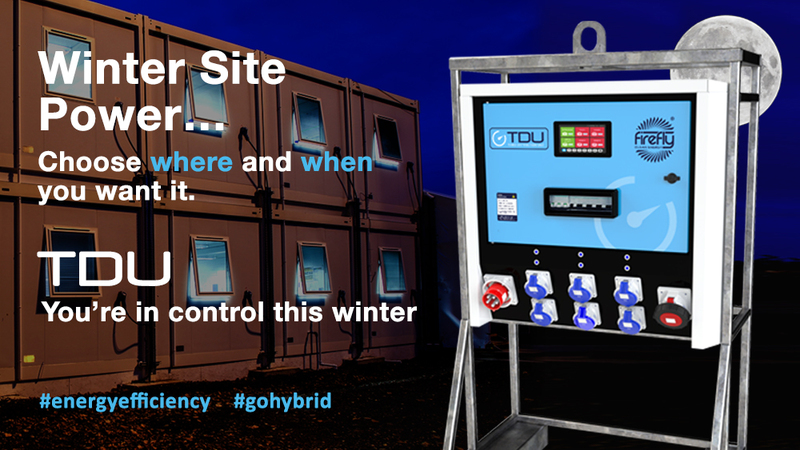 This increase in site power requirements during winter puts pressure on energy saving measures. Firefly has come up with a solution to maximise energy efficiency and reduce diesel generator run-time. Firefly has developed a new product called the Timed Distribution Unit (TDU). We’ve already shared this easy to use product with some of our key customers and the response has been fantastic. Everybody is starting to understand that we must tackle climate change, and from talking to contractors we are aware that this is now part of their strategy too. Air pollution is a big issue in our cities. London’s Mayor Sadiq Khan has been putting forward some big initiatives, which will not only impact on transport but will also affect construction. Statistics say that construction contributes 15% of all NOx and particulate matter emissions in London. Across the UK 40,000 deaths a year are attributed to respiratory disease due to the result of air quality. As an industry, we need to engage and work out how to tackle this. Tier 5 engines will no doubt be part of the solution, but we need a more fundamental change in approach as more legislation will restrict emissions across the board and energy efficiency on site will play a major part in this drive. If you are interested in discussing how Firefly can help you manage your Energy Efficiency on site, while reducing CO2 and providing silent power overnight, please contact us.